I’m putting these events in chronological order, the most recent ones first. Here’s the video. Just click on the link. I haven’t figured out how to make it in a new window yet, so be sure when you’re done to just press the “back” arrow to get back here. and here is an image of the finished product. I think Ralph’s video images of it are better, but this one is sort of okay. Oh, one thing really cool was the area around the “hole”, the “dirt”, is really dirt. The lady next to me gave me the idea and said it was okay for me to jack the idea. She made her dust devil out of dirt. It works much like chalk. Pretty cool idea! 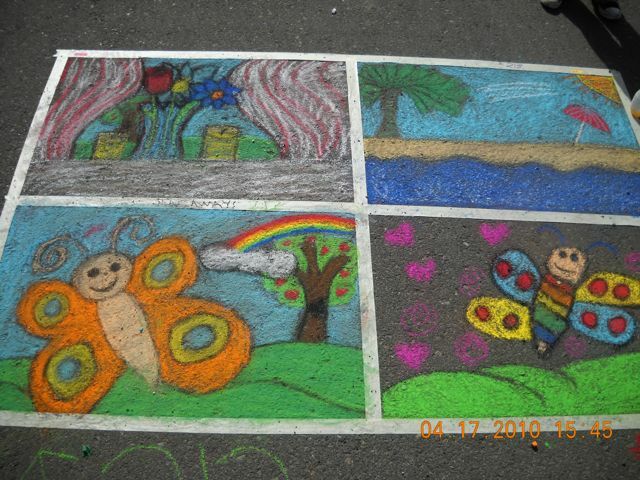 The images below are at the second annual “Chalk It Up”! 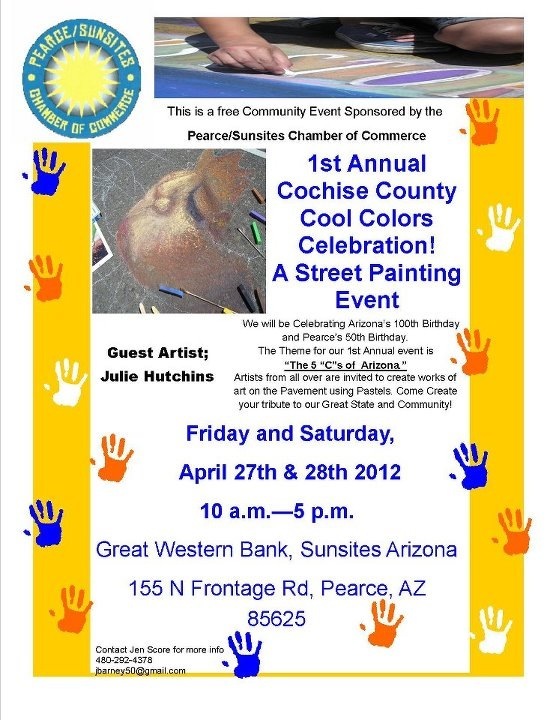 I didn’t know about the one last year because we had just moved here, but when I heard about this one, I called my ever-so talented and beautiful friend Jen and invited her over for the weekend for it. I’d been trying to get her to come visit for a while and I knew this would be the bait to actually get her here. Worked like a charm! 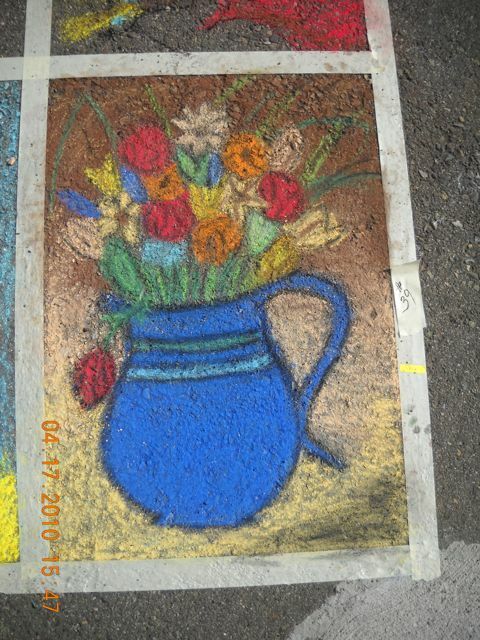 I picked for my chalk mural something safe since I’d not done this in a while. 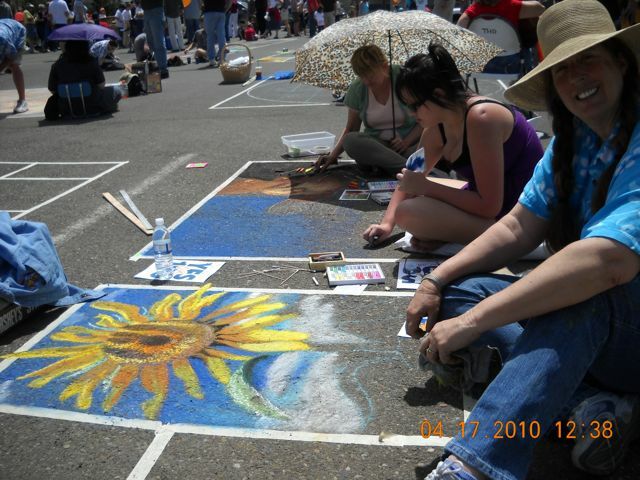 Jen took a workshop in street chalk art so she was awesome with the pointers. 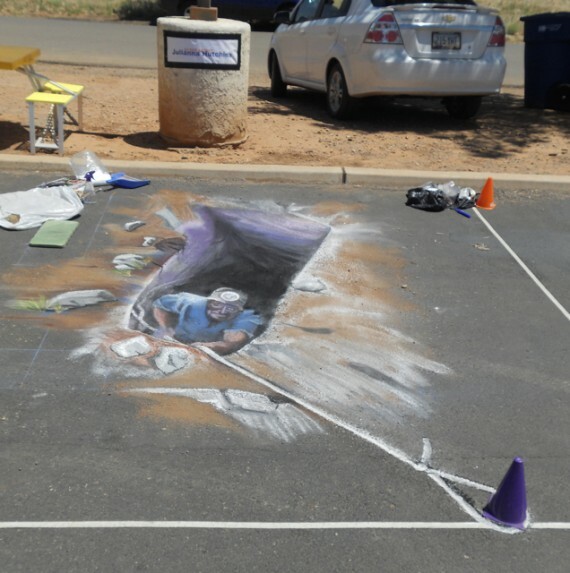 The first thing I learned is that it is better on black asphalt rather than a cement sidewalk. Didn’t sound logical to me, but it’s true. Anyway, I chose my sunflower that I’d done an oil of a while back, and helped Jen find something in my collection of cool photos. She chose an image of a cute little girl blowing bubbles I was going to once make a mural of for some laundrymats that fell through (I think…they’re still working on financing…not sure…big deal.) ANYWAY…here’s what we did. I sketched out the little girl using a grid that I showed Jen and then she went to work her magic on fleshing her out. I did my safe little flower next to her, and we connected them with the bubbles! It was quite awesome, especially Jen’s little girl! Enough chatting, here they are! Oh and the person in the purple is Becka, Jen’s niece. she totally has Jen’s face cause Becka’s mom is Jen’s identical twin. Confusing but cool! 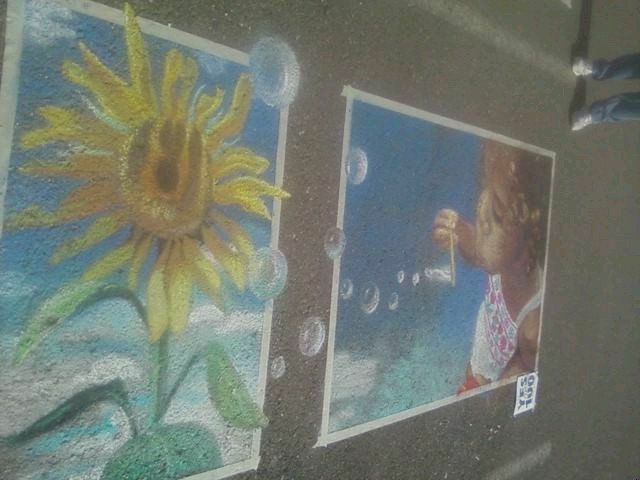 She helped with the sky on Jen’s chalk art. Check out the start of the sunburn from hell on Becka. Poor baby. This is the little girl Jen did. Isn’t she just beautiful? I think it’s one of my fave things Jen did. Too bad it will be gone, vamoosh soon. At least we have these images! This is a pic of the whole thing together. Not such good lighting, but you get the gist. 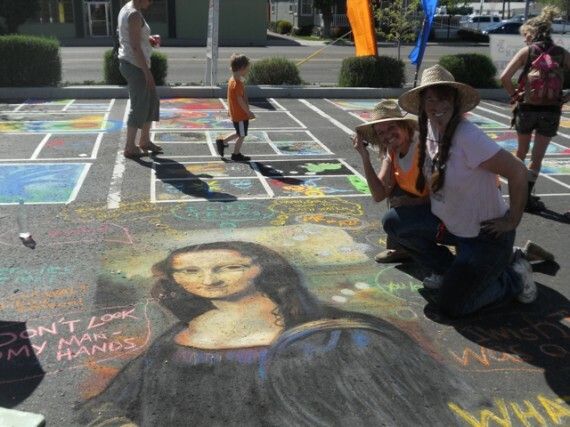 There were a lot of talented artist there. My faves are always the children’s. Aren’t these just pretty? This was my fave of the show (besides ours of course!) 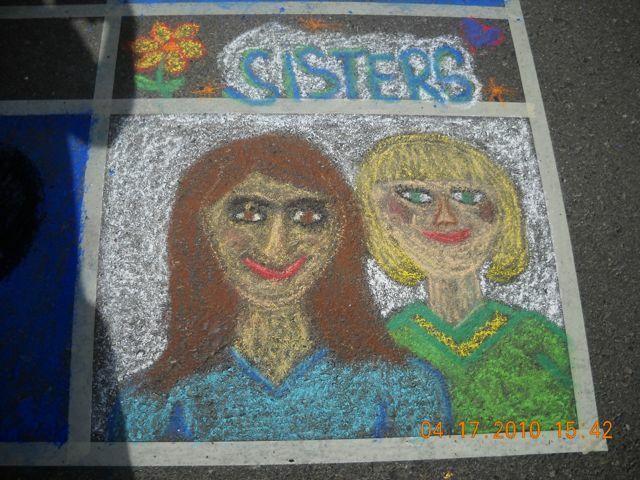 I want Jen and me to do something like this for the next chalk event we do, except a “girlfriends” one. We could draw each other! These are great! It looks like you all had a blast too. 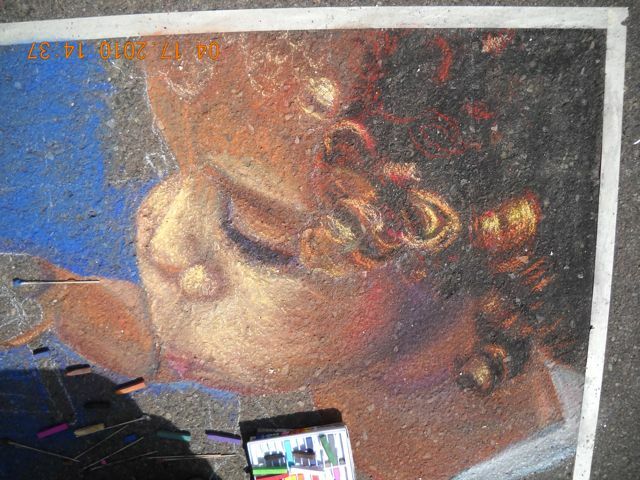 I’m glad you got pics, since they are probably already washed away with the rain.